Give your child a special treat to break up the pressures of the school year. Your child will make memories that will last a lifetime!! Our best ever KARKARA KIDS CAPOEIRA SUMMER CAMP 2018 will be held at our beautiful, fully air conditioned 4,200 sq. ft facility in Boynton Beach. Your child will have a blast, get plenty of exercise and have fun in a positive, nurturing environment. 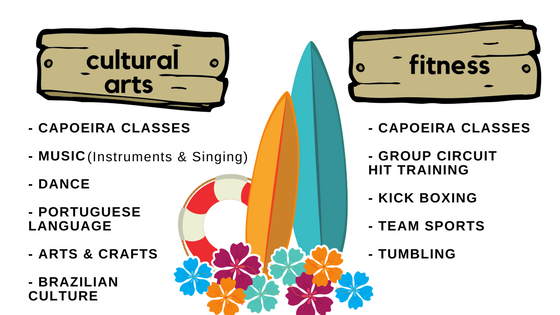 Aside from instruction in capoeira, which is the cornerstone of what we offer to our kids, your child will learn new skills in a specialty area (choose between Fitness & Cultural Arts). We will also be doing fun activities, arts and crafts, organized teamwork building games and going on field trips to fun places for kids of all ages! Our curriculum is designed to enrich the life of each camper – not only physically, but also mentally and socially. By the end of summer, your child will be more fit, strong, focused, and respectful with better life-skills and self-confidence. 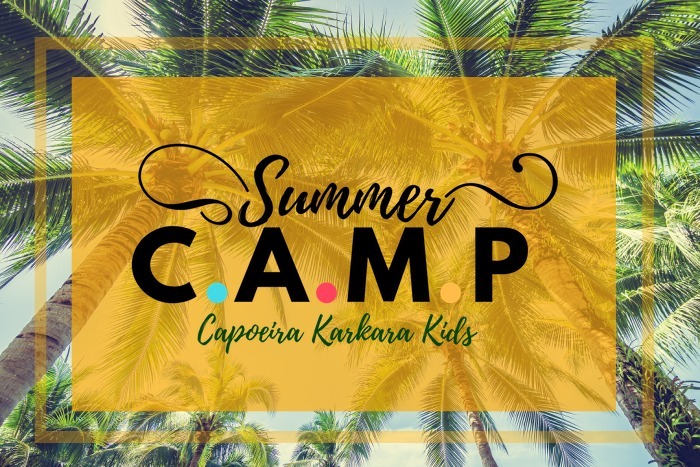 The summer will culminate with our End-of-Summer Celebration, a fun gathering that will allow many of our awesome campers to celebrate with their friends, family and community all of the fun things they have learned during the summer at Capoeira Karkara. We accept children ages 5 – 13. *Some 4 year olds welcome. Inquire for details. 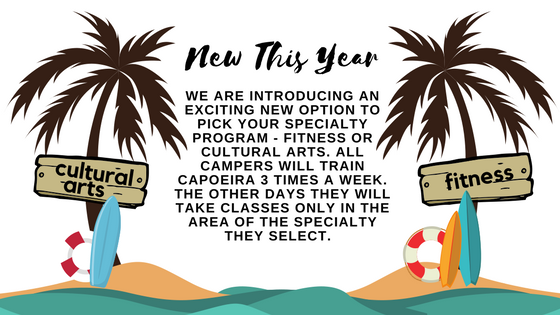 *This adjustment to our programming is designed to help your child get the most of our time together and learn more of the complementary aspects of capoeira that fit their specific interests and talents. Turn in the completed registration form. New students must also complete the Personal Information Form and Waiver. Pay in full for camp tuition. *Deposits and Registration Fee are non refundable. Deposits are applied to the camp balance. Extended hours from 7:30 – 6 pm are also available AT NO EXTRA COST TO YOU!!!! Sign up for Extended hours when you register for camp. This is a sample Schedule to show you normally how our daily routine goes. This is subject to change at the discretion of the camp directors and/or according to our field trip schedule. Please inquire if you have specific questions regarding our daily schedule. If you need to drop your child off or pick up between 9 am & 4 pm please notify us in advance. The camp is directed by Mestre Betinho and Professora Sara Conceicao. They have been teaching capoeira to children locally since 2006 and share their passion for capoeira, fun and fitness with their students in the academy on a daily basis. They have a combined experience of almost 50 years in capoeira and Sara holds a Master’s Degree in Education and is a certified Kids Yoga Instructor. Other qualified counselors and professionals training under Mestre Betinho will assist in teaching during Summer camp. 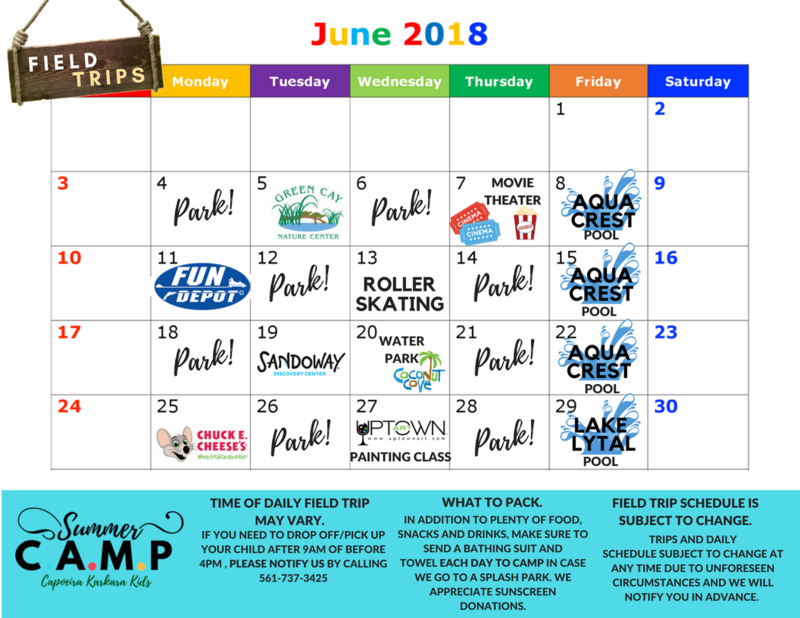 Camper registration is processed on a first-come basis. Due to limited space available, it is recommended to register as soon as possible to reserve your space. If you wish for your child to participate in our Summer Celebration (tentative date/time is Friday, July 27th at 6:00 pm. 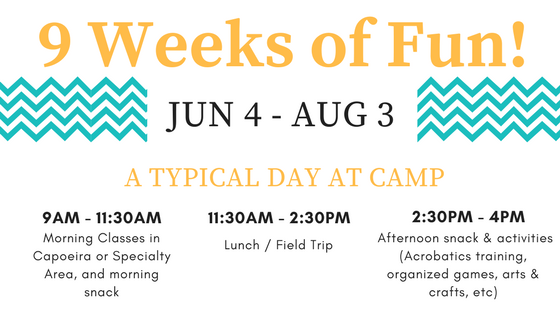 ), it is recommended that you attend all 9 weeks of camp, but it is REQUIRED that you attend camp the week of July 24th-28th in order to participate in the rehearsals. 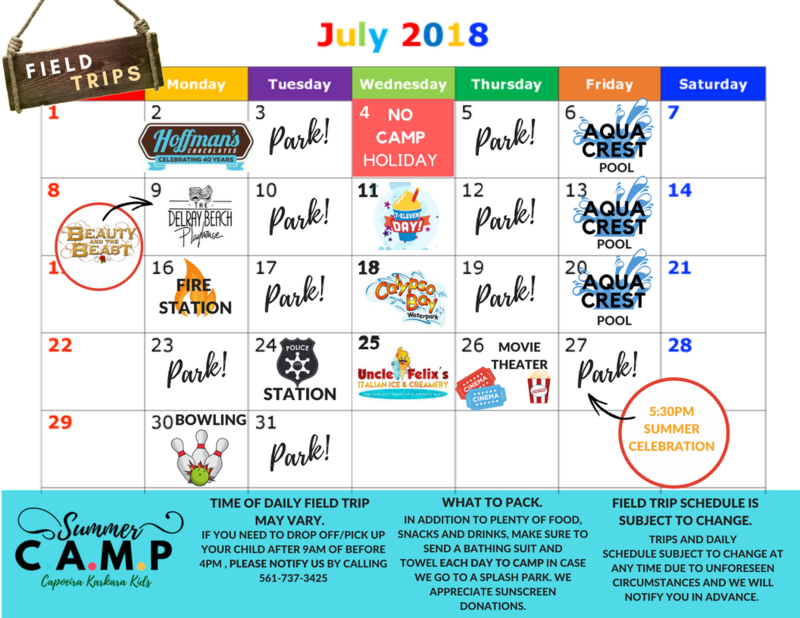 Campers who do not attend enough weeks of camp to participate in some parts of the celebration will all be invited and encouraged to participate in the roda. 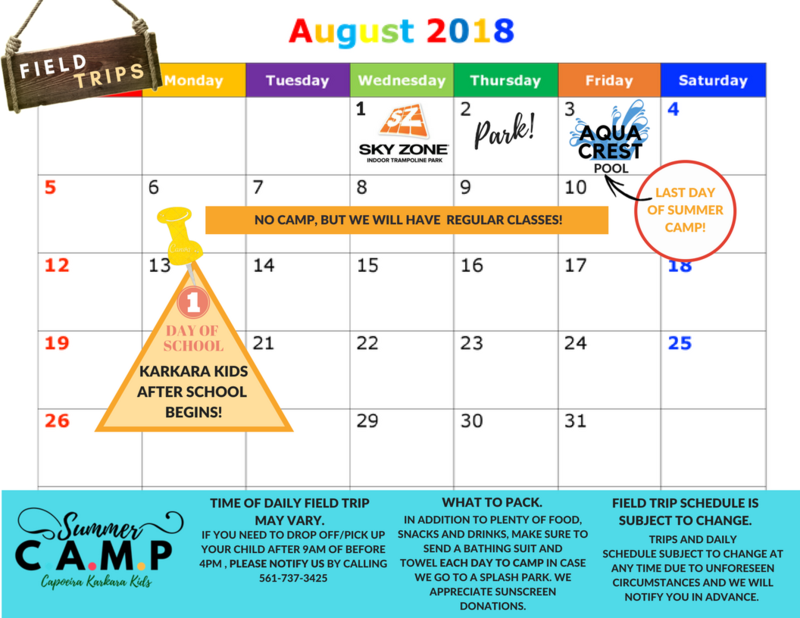 Karkara Kids Camp Summer 2018 will run from Monday, June 4th – Friday, August 3th (no camp July 4th) for a total of 9 weeks. (Must pre-register for extended hours). -> EXTENDED HOURS in A.M & P.M.: Your child may arrive as early as 7:30 am and/or be picked up as late as 6:00 pm daily, at no additional fee. Camp hours are 9 am – 4 pm. For extended hours, you may send to camp with your child items such as books and other quiet and/or relaxing games to keep them entertained while they wait to be picked up and/or wait for camp to start. You may also pack extra snacks. We do not allow electronics at camp! Capoeira camp shirt, comfortable shorts, lunch, 2 (healthy) snacks, water bottle, bathing suit and towel.